Wine glasses, beer mugs, shot glasses, martini glasses and more - raise your glass! These personalized glassware items are sure to catch the eye of beverage holders at promotional events, the grand opening of your restaurant, wedding or special occasion. Order our custom glassware etched engraved or custom imprinted with your logo or message. Save with guaranteed low prices when you order wholesale. Whether you’re looking to have your restaurant logo etched across your glassware selection, or a wedding keepsake with event details emblazoned across it, there are several options available to you. At DiscountMugs we can make the decision process a little easier. You may have chosen to customize your glassware for a number of reasons. Possibly to reinforce branding for your new restaurant or café venture, perhaps as part of a company giveaway, but whatever your needs, your personalization can be as extensive as you require. Toast to the newlyweds with champagne glasses personalized with the family name and wedding date! You can choose from etchings that represent your business or a family tradition, and you’ll find that your customized glassware can be both practical and a great keepsake for long after the event. With a variety of materials, styles and sizes to select from, there’s a lot you can achieve with a little creativity. Personalized glasses are the ideal souvenir, gift, or even simply a way to spread your brand to new audiences, so it’s essential that you have a firm idea in mind of what you want to achieve. At DiscountMugs, we offer a range of customization options when it comes to your glassware. Depending on the style of the glasses, you can choose from options that include custom printing a company logo, etch, engrave, or monogram text, or even personal artwork. 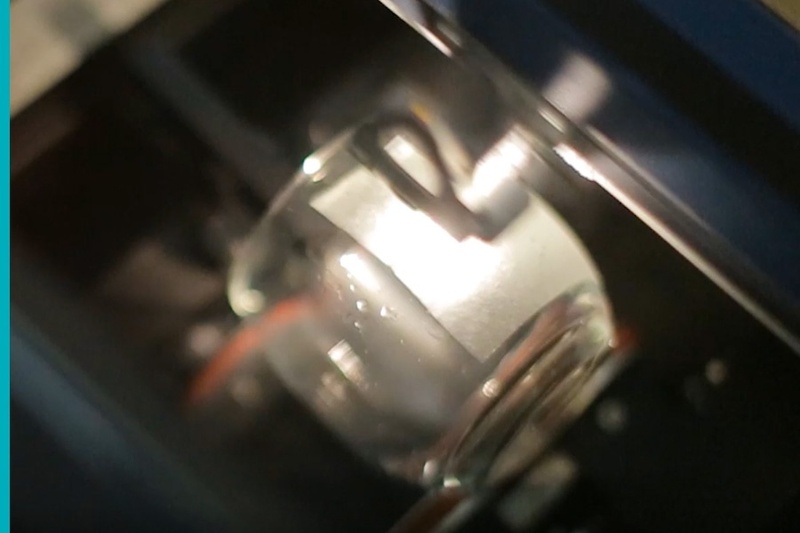 No matter what method you choose, your design imprinted directly onto the glass itself. You may opt for laser engraving if an elegant finish is needed – it’s also longer lasting result and ideal for weddings or anniversary celebrations. A full-color imprint is perfect for those who wish to use photographs or detailed artwork (like logos) on their glassware. Color is a vastly underestimated element when it comes to personalization and depending on the style of glassware you choose, you’ll have a number of options. 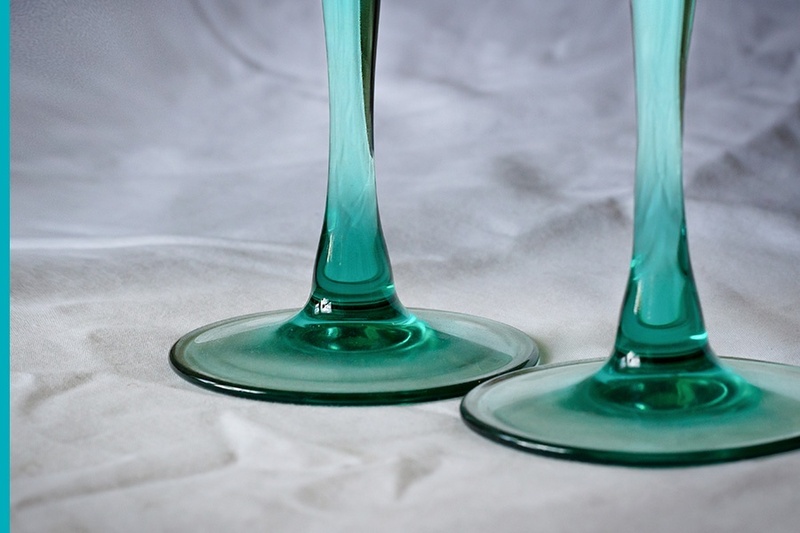 Coloring the stem of your glassware of choice is one of the most popular ways to add color to an event. And, if you're gifting customized glassware, then you can opt for the recipient's favorite color. You don’t have to limit yourself to the stem either, you could even opt for something a little more flamboyant and colorful, like our light up plastic drinkware. Be sure to select your colors according to the scheme of the décor. • Soda Lime Glass - One of the most popular choices, soda glass is not only durable and inexpensive, but it’s also dishwasher safe. Whether you need your glasses to survive regular use in your busy eatery, or simply want the best value for the lowest price, then it may be the best fit for you. Soda lime glass is perfect for those expecting regular use, so it’s no surprise it’s among the most common glass type for busy bars and restaurants. • Crystal - Everyone loves a good crystal glass. They’re a simple way of adding a touch of class and elegance to any occasion, plus will last a long time. No matter the occasion, personalized crystal glasses are the perfect combination of quality, durability and class. Whether vintage style glassware or something a little more modern, the transparency of the crystal glass allows for maximum light to penetrate through the liquid - there’s a reason why crystal glassware is considered one of the best options when it comes to aficionados. • Lead Crystal -For those looking for the finest quality glassware, then there’s nothing quite like lead crystal. It may be suited for those limiting their use to special occasions, but lead crystal offers a clarity that is unbeatable. Still managing to have the weight of a glass that inspires confidence in its use, lead crystal is perfect for formal events and occasions where elegance is they priority. If you’re considering wine glasses and smaller choices such as whiskey tumblers or brandy glasses, then lead crystal is your best choice. They allow for a whole new appreciation of your drink of choice. No matter what your glassware needs may be - from environmental concerns to reusability, or even event and location where the glasses will be used – at DiscountMugs you’ll find one for your special requirements. • Environmentally Sustainable - All our glassware is recyclable, which is becoming a more regular requirement for customers hoping to reduce their carbon footprint. As we all try to reduce waste, it’s good to know your glassware won’t end up taking up space in a landfill. What better way to celebrate but with Eco-Friendly customized glasses. • Reusable - Disposable drink receptacles are outdated and a waste of money. That’s why we ensure that every glassware product we sell can be reused. Whether you run a busy bar and your glasses need repeated cleaning, or you’re planning a family event that only takes place once or twice a year, our glasses can be washed, dried and store with minimum fuss. A one use only is not our style - make the most of your buying power and you won’t regret your decision. • The Perfect Gift – Perhaps it’s a teacher who inspired you to succeed, or your parting present to a long-term member of your staff - a personalized and quality glass will speak (and hold) volumes. Whether the recipient is a red wine connoisseur or a brandy aficionado, you can get creative with your customization options. Choose to customize the color of the glass, print a photo across the bowl, or simply add the recipients favorite color to the stem. From anniversaries to congratulations, a personalized glass is the perfect gift. • For Weddings - Nothing speaks quality like raising your glasses for a toast with your personalized champagne glasses. Not only are personalized glasses a great gift that will later serve as a reminder of the day itself, they’re also a great way to ensure you don’t miss out on the awaited anniversary gifts the following year. Choose your colors to match the theme of your wedding and make them as unique as the event itself by printing or laser engraving a quote that’s close to your heart. • For Businesses - Branding is an important element of business at both in-house and industry levels. You can always hand out business cards to potential investors and clients, but there’s something far more memorable about a cocktail in a martini glass personalized with your company logo. A common way to reinforce your branding, you many opt for notebooks or pens. However, custom glassware is a great gift idea with far more impact. Give to employees that excel to show appreciation, and customers with whom you want to strengthen the relationship. • For Daily Use - If you run a restaurant or bar, then glasses are vital to your work. You’ll want a product that is both easy to clean and durable for sustained and regular use, but also reflects on the values of your business. Order glasses engraved with your bar logo and select colors that seamlessly fit into the theme of your venue. If you hold regular tasting nights or have regular customers you’d like to treat to their own beer mugs or shot glasses, then customization is the best way forward. • The Family Occasion - It’s not always about a business or weddings. Sometimes, it’s just the perfect time for that long overdue family get-together. Whether it’s a gathering for the holidays or a summer barbecue in the garden, custom glasses are memorable party favors that can be enjoyed together and kept as a memento of your time together. The best part about personalizing glasses for a family event is you can keep it light and humorous. Get creative and engraved with a long-running inside joke, or simply your family name and event date. Now that you’ve decided to personalize your glassware, you’ll need to decide on a glass style. This part may be trickier - party due to the wide variety available – and you may end up confused as to what the best choice is. • The Cocktail Glass - Cocktails are as diverse as the glasses in which we drink them. Understanding the varieties in cocktail glasses is important because you won’t want to serve martini cocktails in a long glass! Your glasses will have to suit. Shop highball glasses if serving Bloody Mary’s and the ever-popular Screwdrivers, or tumblers for cocktails that have little in the way of mixers. Smaller tumblers are perfect for alcoholic beverages that don’t rely on mixers at all and are perfectly sized for a few shots of your favorite scotch with a dash of water or ice. 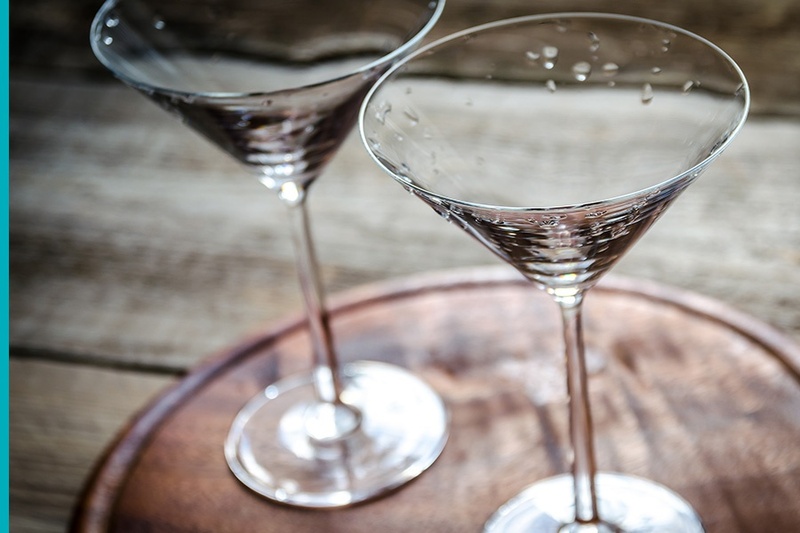 However, more iconic cocktails will require specialized glassware like martini glasses. Instantly recognizable, they are designed with large bowls and long stems, so that the temperature of the drink is more easily managed and kept consistent for as long as possible. It’s vital you choose the glass-type most suited to your beverage option. • The Spirit Glass - Nothing beats a good brandy or a fine bourbon, and it’s important you know the difference - the glass in which you serve it can either complement or detract from the drinking experience. Brandy glasses allow the warmth of your hand to slowly warm its content. A sought after and stylized design, the opening of brandy snifters are specifically designed to trap the scent of the drink, allowing for maximum tasting experience. • Beer Glasses - There are almost as many options when it comes beer glasses as when it comes to beer itself. The curvaceous pilsner glass allows for the ideal distribution of head and drink, while the slender perfection of the blonde pint glass maximizes the malty flavors of rye beers or bocks. The key to choosing the best beer glass is understanding beer itself. Look for a glass style designed to bring out the maximum enjoyment for the style of beer you plan on serving and keep in mind that pouring the right drink into the wrong glass can reduce the quality of its contents. 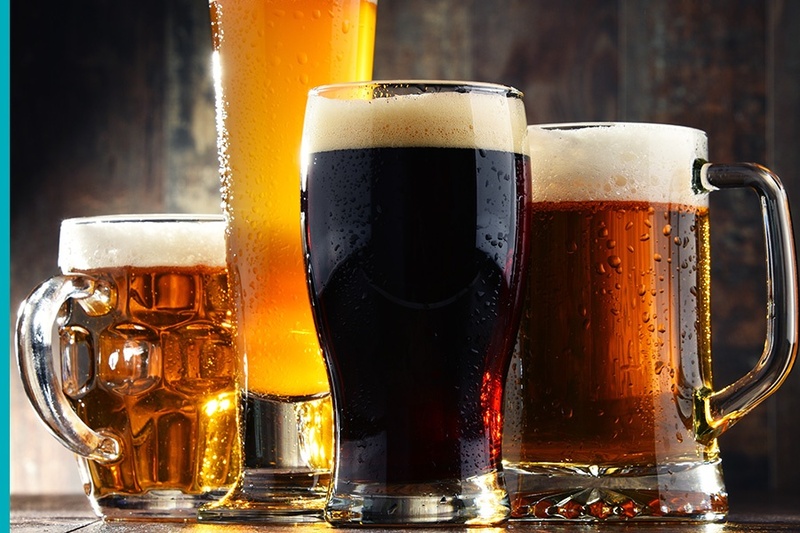 Beer (whatever kind) is highly popular, and the range of options is vast. Select from unique ceramic steins that reflect on your intent and grab the attention of your guests when they start to arrive, or plastic beer mugs in the case of more casual events. At DiscountMugs we make it easy to shop for drinkware no matter the size of your venue, the time of year, or occasion. Customize for a personal touch and let us take care of the rest. • Wine Glasses - Wine is ever-popular and the ideal beverage to serve on special occasions. 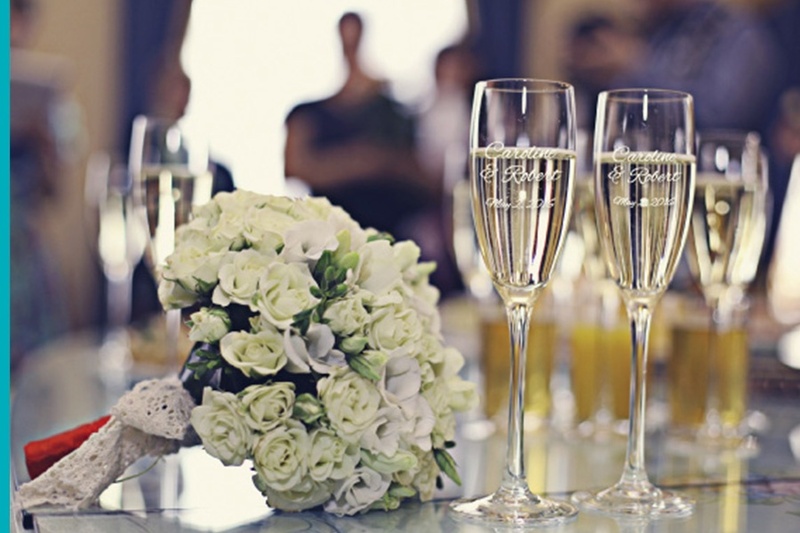 However, choosing the right glass for your event is essential. Red wine glasses tend to be taller and feature larger bowls than traditional white wine glasses to ensure the aromas and flavors breathe and blend together to get the maximum effect of your drink. White wine tends to be served in more U-shaped glass designed to release the aromas of your wine while also keeping the temperature at the chilled temperature it needs. Although it’s perfectly possible to use one type of glass for all wine varieties, following etiquette will improve your credibility. It is essential bars and restaurants serve wine in the correct glass - failing to take the options into account will not reflect well on your business. Glass size is often under considered. Even standard beer glasses come in a range of sizes, so be sure you know what you’ll need for your event before committing to a style of glass. While the 16 oz. pint glass is the traditional option, it may well be that your event calls for something different. In which case, you may be better off choosing a 12 oz. plastic mug, or go all out with a magnificent 21 oz. beer mug or even the 34 oz. barrel mugs. The correct size for your glassware of choice will come down to the event, audience, and the type of drink you will be serving. You might want to keep some options available, as sometimes guest will prefer their beer in a smaller glass, and chic crowds will delight in stemless wine glasses. From margarita glasses to carafes for your beers, from the unique liquor glass to the bespoke champagne flute, the decision on what to buy will come down to your beverage options. Having the correct glass sets the tone for your event, and whether it’s a family barbecue in the summer or the opening night of your new restaurant, you’ll want absolutely everything to be as perfect as it possibly can. Take the time to reflect on your needs and make sure you have a firm idea on your audience. You won’t want to buy lead crystal champagne flutes for a gang of rowdy teenagers, and you’re not going to want to serve that expensive liquor into a wine glass. Being aware of the type of drink you’ll be serving is fundamental when it comes to your glassware selection. The choices for a restaurant will be different than those made by someone planning a birthday party or a wedding. However, ensuring the right drinks are poured into the right glasses can make all the difference. Consider your customization options, too. With everything from your business logo to family joke, as well as a full range of color options, your custom glassware can be as unique as your special occasion. Finish off with a personal touch, and you’ll end up with more than a memory: you’ll also have the perfect glass to use and enjoy for a long time.